Tactical Innovations is famous for their adjustable Ruger 10/22 Magazines but everything else they make is just as exotic. For example their new 10/22 receivers are rear charging... Like an AR15 rifle. And there's much, much more! semble easily for cleaning. Very nice! Taking the Ruger 10/22 Bolt Spring and Guide Rod up a notch in precision, the Tactical Innovations Heavy Duty 10/22 Bolt Spring System lets you set-up your bolt to cycle and feed just about any ammunition. The clip retainer on the guide rod lets you take the spring off conveniently and snip a coil off the spring until it's just the tension you need. Original factory guide rods use "peened" wide spot to retain the spring and its not easy to take the factory spring on and off for adjustment. The Skeletized Ruger 10/22 Bolt Handle Assembly combines a beautifully skeletized bolt handle with the clip retainer style guide rod and bolt spring system. This assembly comes as a single unit you simply swap out with your factory unit. Possibly the most ingenious idea we've seen for the Ruger 10/22 this year is the new "Rear Charging" 10/22 Receiver. It "Charges" or racks the bolt the same way an AR15 does. It's a completely new receiver housing that uses your original bolt and trigger guard assembly. After pulling the rear T-shaped charging handle backwards, it locks forward and stays there as you fire ( doesn't cycle backwards with each shot). As you shoot, the bolt cycles back and forth with no bolt handle protruding out the side... It's almost like a completely different firearm. Combine with a pistol grip stock for AR simulation. 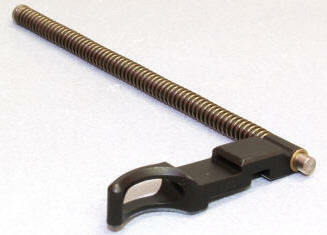 The original Ruger 10/22 guns stock screw can now be replaced with a precision stainless Allen head screw. It's pretty neat looking but also quite practical as original screws can get the screw slot stripped or buggered up. And last but not least, the Tactical Innovations Adjustable V-Block allows you to get a perfect answer to the particular barrel "droop" characteristics of your personal Ruger 10/22. The factory V-Block tightens your barrel back and down, which can negatively effect scope alignment. This adjustable V-Block lets you tighten the barrel with little or no barrel droop!